Ultravac Vacuum Packaging Machine Special Promotions! Get the Best USA Made Chamber Vacuum Sealers Backed by An Industry Leading 2 Year Warranty! Hurry! Talk to a packaging specialist at 816-207-3774 or message us today! With over 135 years of industry experience, UltraSource is the trusted choice for processing, packaging, and labeling solutions, service, and expertise. Offers end 4/30/2019. Offers subject to change. Dealers and distributors are not eligible for special offers. Financing for US-based customers that qualify via a 3rd party financing firm. 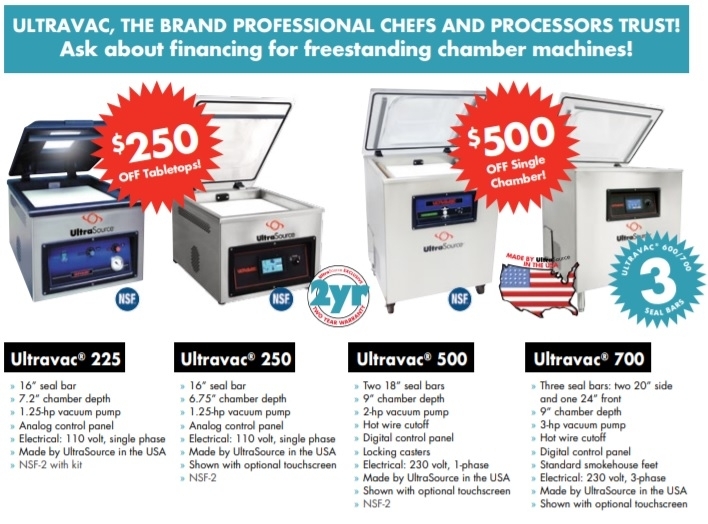 Only qualifying customers that purchase a double chamber vacuum packaging machine at full price are eligible for 0% financing for up to 36 months. $16,495 Ultravac 2100 price does not include taxes or shipping charges. UltraSource is a leader in vacuum chamber packaging. UltraSource single chamber vacuum chamber packaging machines include tabletop and freestanding machines. UltraSource single chamber tabletop vacuum packaging machines include the Ultravac 150, Ultravac 225, and Ultravac 250. UltraSource single chamber freestanding vacuum packaging machines include the Ultravac 400, Ultravac 500, Ultravac 600, and Ultravac 700. The Ultravac 600 and 700 come equipped with 3 seal bars offering excellent production capacity. UltraSource double chamber vacuum packaging machines include the Ultravac 800, Ultravac 880, Ultravac 1000, and Ultravac 2100. The Ultravac 2100 is legendary for its durability and performance. 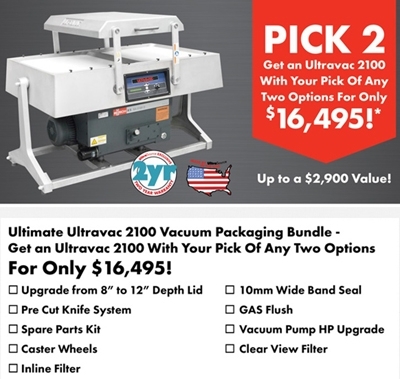 The Ultravac 2100 chamber vacuum packaging machine is the number 1 American made model in the market. Our commercial chamber vacuum sealers greatly extend freshness, flavor and shelf life of products by removing the oxygen and creating a strong seal. You can also select a vacuum chamber sealer with gas flush capabilities for greater packaging options and shelf life. Our vacuum chamber sealers can store numerous program settings to make it easier to package a variety of product types. You simply select the setting you want and close the lid. Once the lid is closed the machine automatically begins the sealing operation. 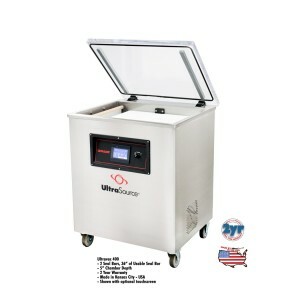 The Ultravac commercial vacuum chamber sealer line includes small, medium and large vacuum packaging machines. We believe our small tabletop commercial vacuum sealers are some of the most popular and reliable on the market. Our tabletop commercial vacuum chamber sealers have space savings designs and you can choose from less to more configurable designs. The Ultravac 250 tabletop vacuum packaging machine can be configured with 2 seal bars and gas flush operation, for example. UltraSource free-standing single chamber vacuum sealing machines give more sealing space and chamber depth for larger products and production runs. Two of our freestanding single chamber vacuum sealers are equipped with three seal bars for extra vacuum sealing space. Double chamber Ultravac vacuum packaging machines provide significant production capacity and fast cycle times. Our largest commercial double chamber vacuum packaging machine provides 39" of seal bar length in each chamber and our most popular Ultravac 2100 provides 26.5" of seal bar length. 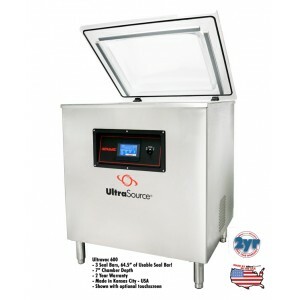 Ultravac vacuum sealers are built for robust commercial use, unlike home food sealers. 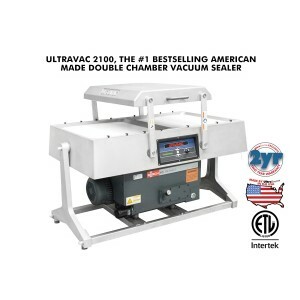 Ultravac chamber sealers are superior to other commercial vacuum sealers because of their design, construction, and premium components, such as Busch vacuum pumps. 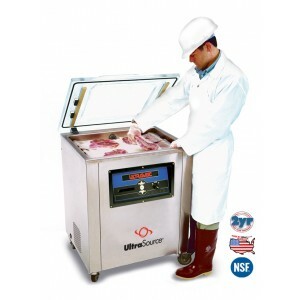 UltraSource is a pioneer in vacuum chamber packaging and the Ultravac machines are long-lasting. 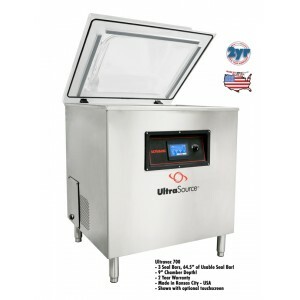 UltraSource has a readily available supply of commercial vacuum sealer parts, supplies and service expertise to help ensure you maximize use of your chamber packaging machine. Speak with a chamber vacuum packaging specialist now at 816-207-3774 or message us!